Are you ready to look healthier,slimmer and sexier than you have in years? 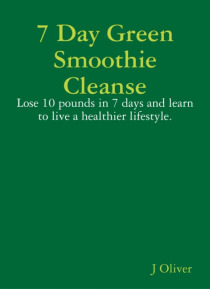 Then get ready to begin the 7-Day Green Smoothie Cleanse!This book provides a shopping list, recipes, and detailed instructions for the 7-day cleanse, along with suggestions for getting the best results. Within this book there are over 100 detailed recipes made from leafy greens and fruits, green smoothies are filling an… d healthy and you will enjoy drinking them. It also offers advice on how to continue to lose weight and maintain good health afterwards.